Animology Glamour Puss No Rinse Cat Shampoo is a dry shampoo for cats. The dry shampoo has been specially developed for a mild and effective cleaning of your cat's coat. The Animology dry shampoo removes dirt and grease from your cat's coat without the need for a bath. The dry shampoo has been specially developed for a mild and effective cleaning of your cat's coat. The Animology dry shampoo removes dirt and grease from your cat's coat without the need for a bath. The spray promotes a soft and glossy coat and leaves a lovely papaya or peach scent. Spray it onto the cat's coat and comb it through. Do not rinse. Water, Polysorbate 20, glycerine, sodium benzoate, Peg 7 glyceryl cocoate, potassium sorbate, Saccharomyces Ferment, panthenol , EDTA , Perfume, Aloe Barbaensis (aloe vera) leaf juice, Linalool, Limonene . 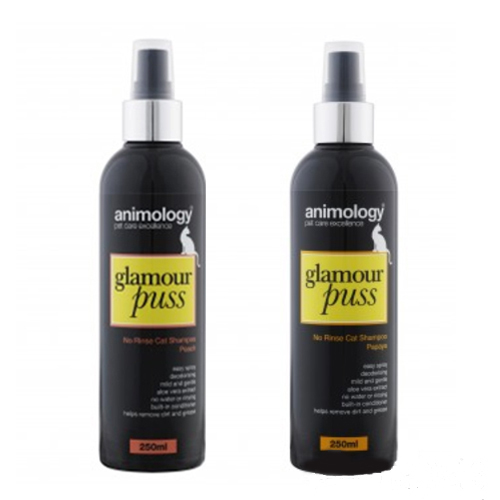 Have you used Animology - Glamour Puss No Rinse Cat Shampoo before? Let us know what you think about this product.